Sid and I knew we would have to build. We already owned the land we lived on, and we weren’t leaving. Sid’s parents and grandmother were just a short walk through the woods and donkey pen. We loved that the kids would grow up living so close to grandparents. So we were already living on our dream land, just not our dream house. Not even a house at all. But a very leaky, rotting, moldy trailer. 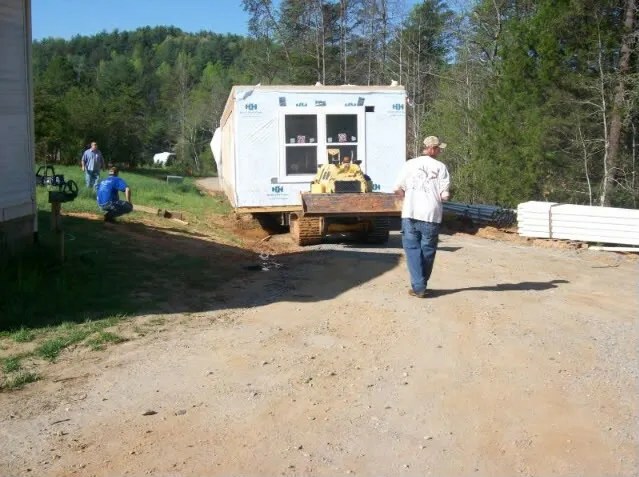 Though we were motivated to get out of the trailer before it fell in on us, we dreaded building. We had heard too many horror stories, seen too many people caught up in stress and anxiety, too many marriages stressed beyond belief. Sid had installed septic systems for many very nice homes, (some were even million-dollar homes) and rarely did he meet a homeowner who was happy with their newly built home. We knew there had to be a better way. 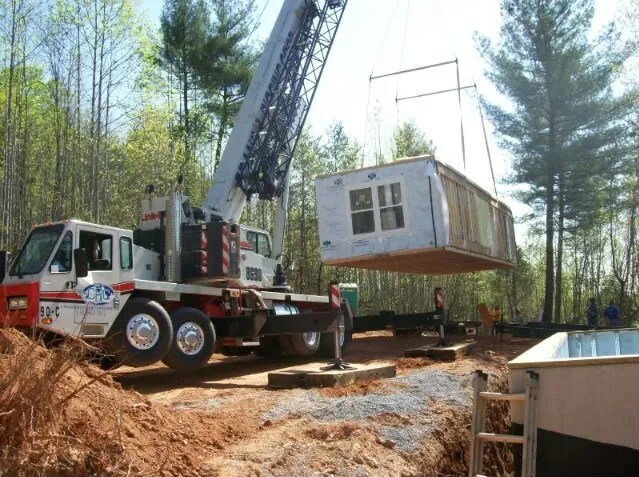 We had heard of modular homes and thought that might be the answer. After looking into it, talking to people, researching a little more, we felt this was the way to go for us. 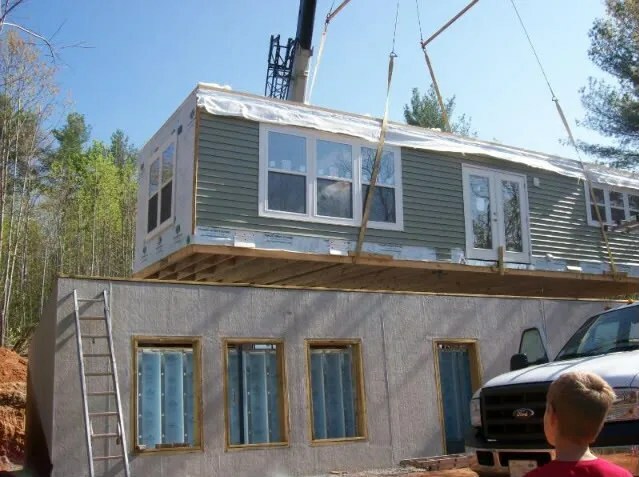 We finally settled on modular home built by HandCrafted Homes. Actually, I mostly designed our home and HandCrafted agreed to build it. 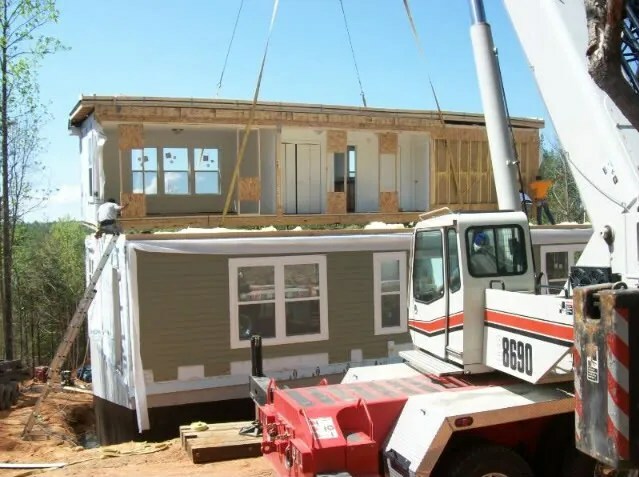 Many other modular home companies did not want to build my plan but wanted me to choose from their stock plans. 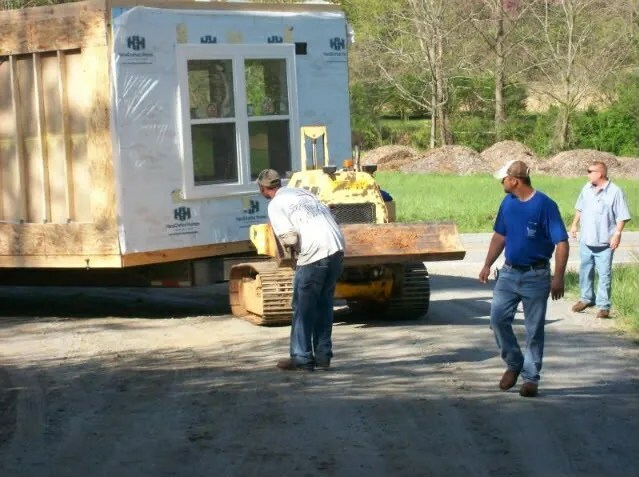 The house arrives on 4 trucks. I was also impressed that Donna and Emory never encouraged us to “upgrade” to more expensive options. I’m sure that upgrading would have meant more profit for them, but Donna sat back and let me tell her what I wanted. Donna, you were a life saver, and you made our whole building experience so pleasurable. Bless you, woman! I will always be thankful to you. 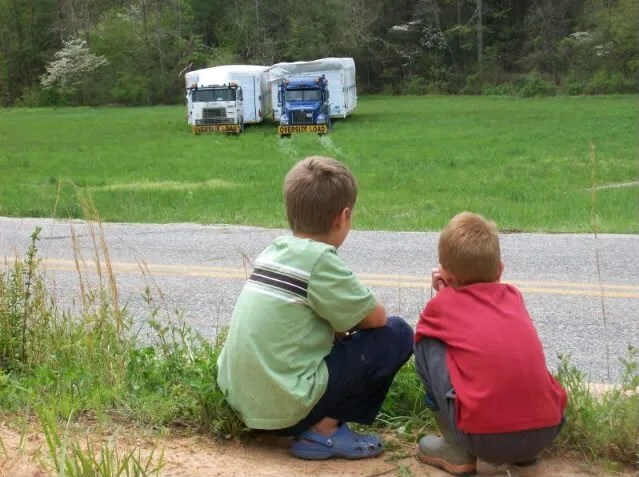 The boys watch as they park our house in our neighbors field across the street. Praise God for good neighbors. There were no hidden costs or fees. This is pretty amazing, especially considering that we contracted out some of the finishing detail. I had a local cabinetmaker build the kitchen. We ordered wood floors off ebay and Sid installed them. We were able to crawl inside the 2 ground floor sections and explore. We only peered in the windows of the 2nd story sections. 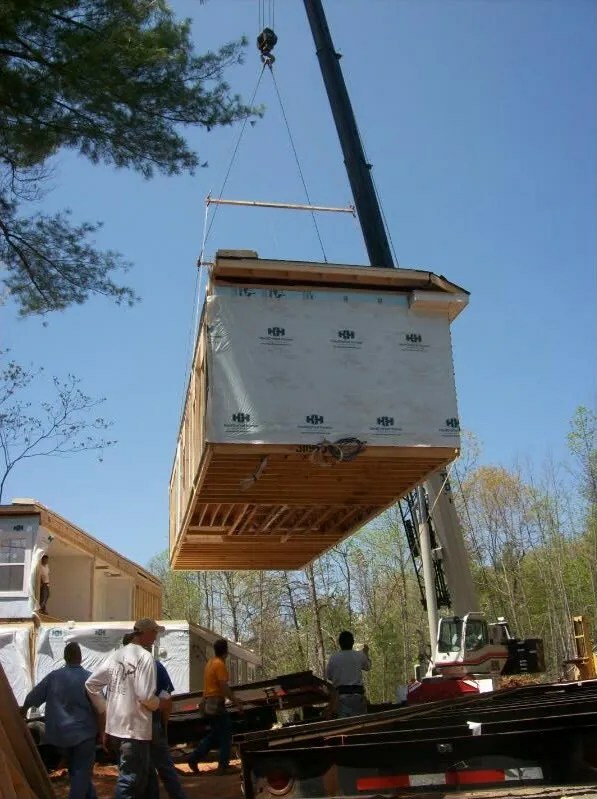 Choosing to work with Distinctive Housing and HandCrafted to build a modular home was the best decision we could have made. 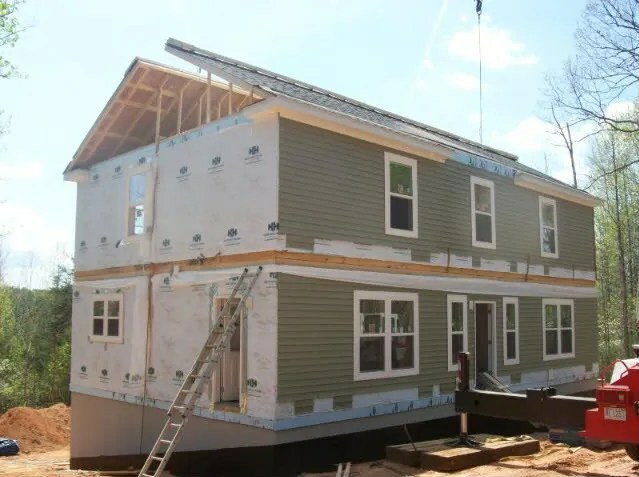 A common problem with homebuilding is staying on budget. We had seen the great stress it caused when people went overbudget. But with a modular, we didn’t have this problem. Plans were made, agreements were reached, papers were signed. We knew how much it would cost us, and Distinctive Housing and HandCrafted agreed to build it. Period. 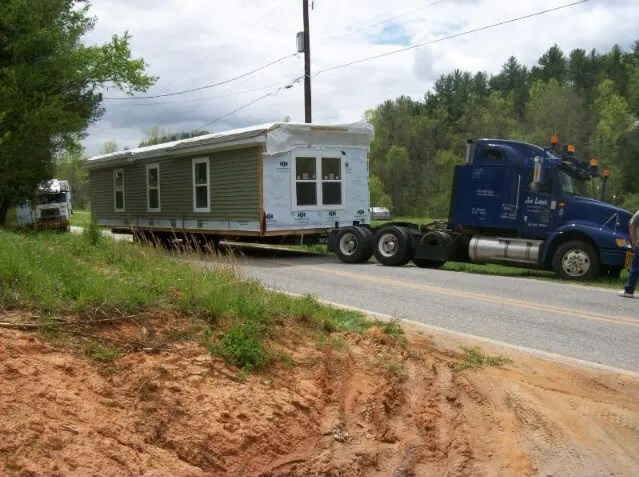 It did take longer to move in that originally planned. However, this is partly because we had “extra” things. For one thing, we wanted a basement. Sid specifically wanted a Superior Walls basement. 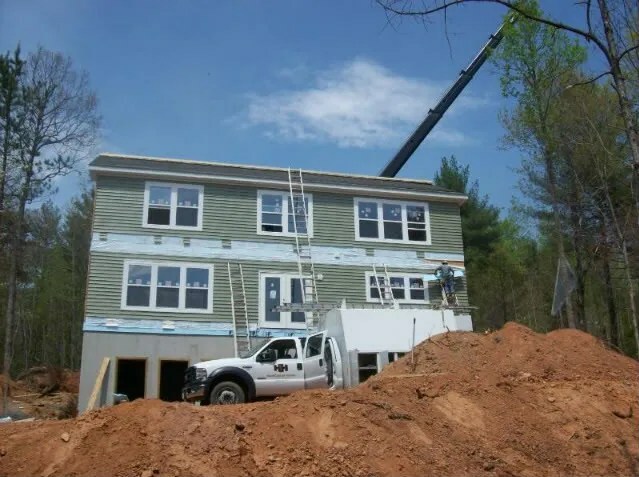 This took a little more time, as it was done by a different company than our modular manufacturer and required some coordination. 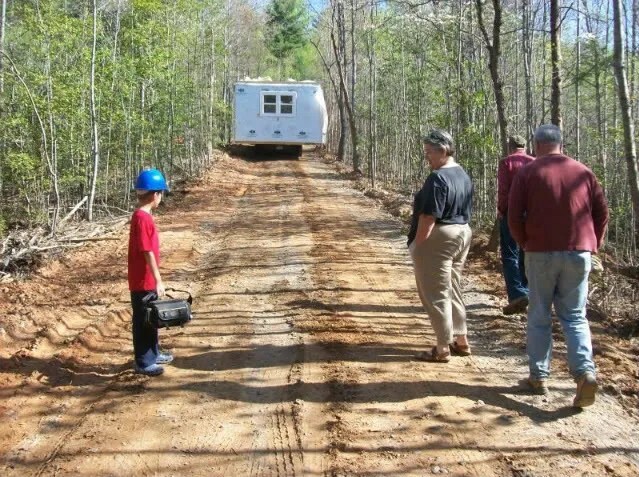 The little dozer-looking machine is called a house-kat and it is remote-controlled by the guy in the white shirt. The house-kat is the little boy’s or man’s ultimate big toy. Sid also built our driveway, dug the basement, installed the septic, ran our water lines and did the final grading. He also installed the floors, which he could only work do on weekends. It took him several weeks. 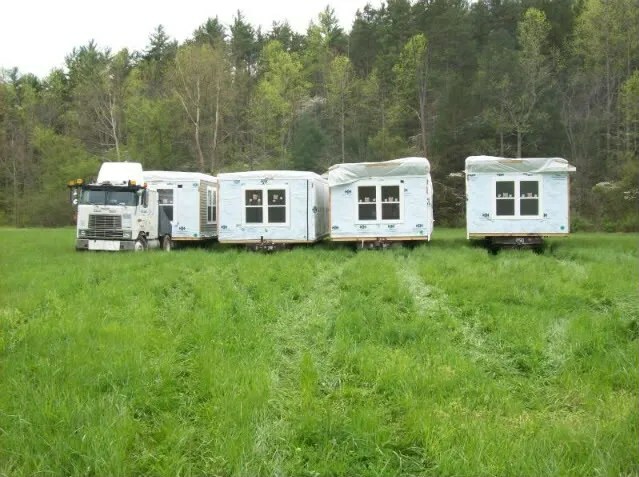 The beautiful new house meets our old, leaky trailer (seen on the left). Our new modular preens, showing her DRY, rotten-free structure. Then we had to get the floors finished by a professional. Finally, our cabinetmaker could get into the house and do his thing. We had quite a few neighbors near and far (Charlotte even) turn up to watch our house being set. So we had a lot of extraneous stuff going on that lengthened our housebuilding time. Our house arrived in April 2008, I think. We moved in late September 2008. 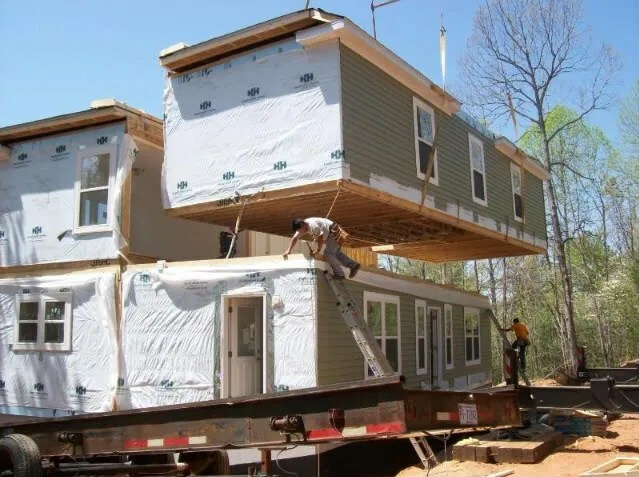 I can’t believe they are lifting my house with those flimsy-looking straps. I wonder what they are made of? For the most part I am very happy with our house. The only things that I don’t like are very minor things, like where this light switch is placed. Things that are really no big deal. The 2nd section being lifted. Notice the front wheels of the crane truck. The crane is stabilized on its outriggers. 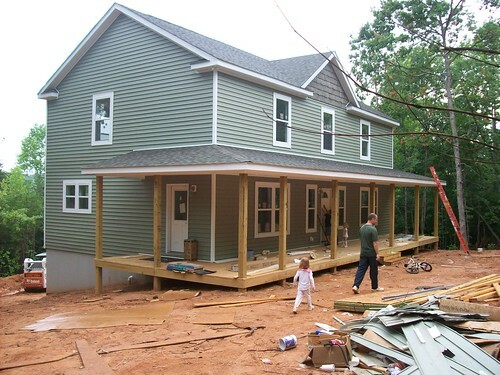 And I am happy to say that we built our house with minimal stress. Pretty amazing, considering that I was very sick most of the time it was being built and anxiety is one of the symptoms of my disease. 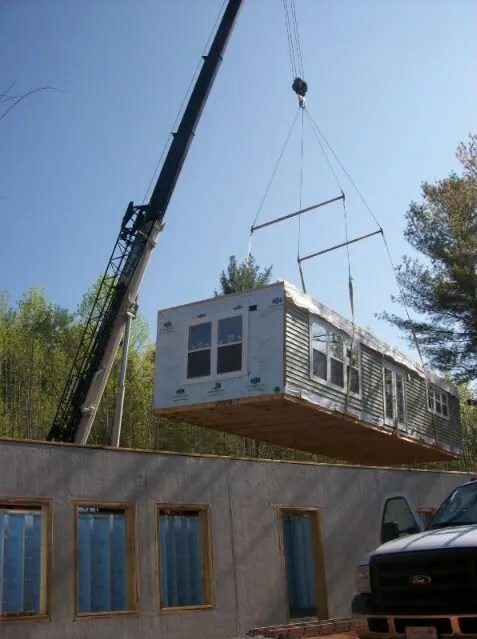 I can even say that I would consider building again, but only if it is a modular built house. Sorry. 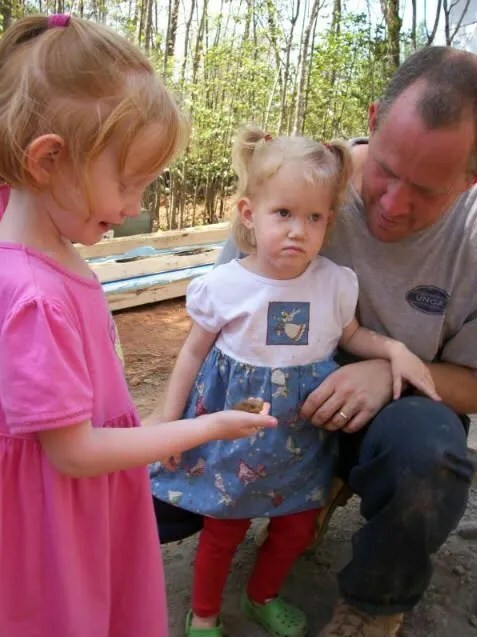 I was momentarily distracted from the house by a cutie with a toad and a cutie in pigtails. I was really wishing this guy wasn’t quite so brave and nonchalant about crawling under my house. I held my breath and prayed he would not get crushed. 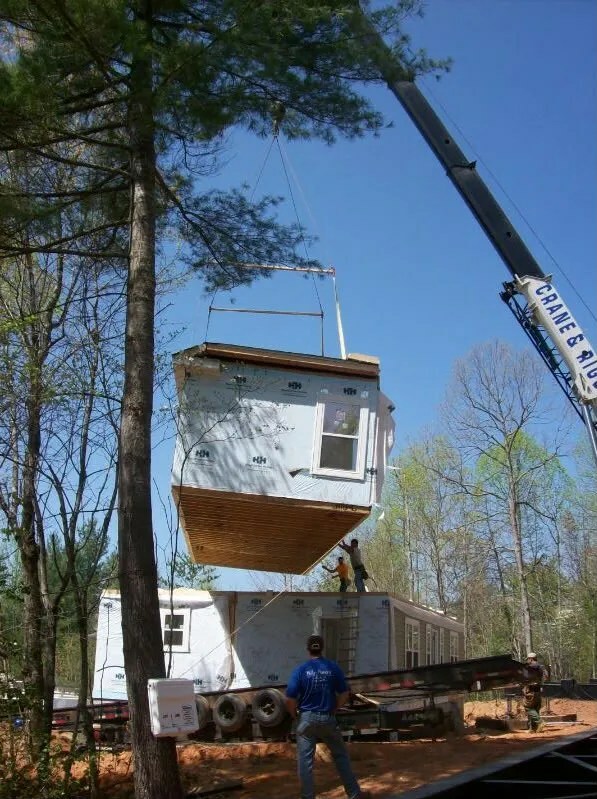 The crane lifts the hinged roof. I thought the roof part was sooooo cool. Gulp! It looks a little . . . . . tall. And impressive. I wasn’t shooting for impressive. 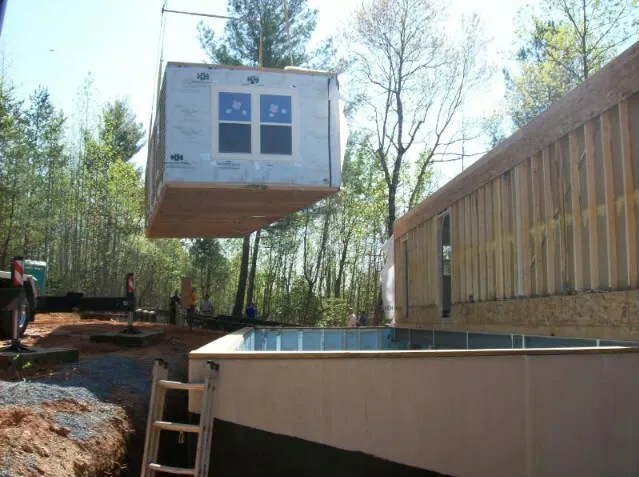 I actually prefer the little-cabin-in-the-woods look, but impressive is cheaper. The two-story with a simple roof line gave us the square footage we wanted for a minimal price. 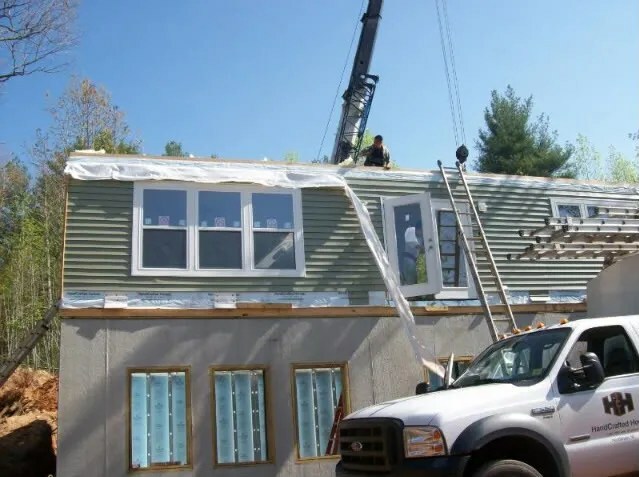 I’m always amazed that people are willing to pay big bucks for a complicated roof line. The whole house put together in a day! We chose to spend money a little differently — like wood floors instead of carpet. I don’t plan to EVER replace the floors. And I love our custom kitchen cabinets. Though “custom” does not equate big bucks in our case. My cabinet guy doesn’t charge nearly what he would get in a bigger city. In fact, his estimate was half what several other custom kitchen places told me. And he does top-notch work. Bless him! I love my kitchen. I also love my shutter-less windows. After talking with Donna about how much I disliked fake shutters on homes, she suggested Hardie Plank trim around the windows. It is exactly the look I wanted. 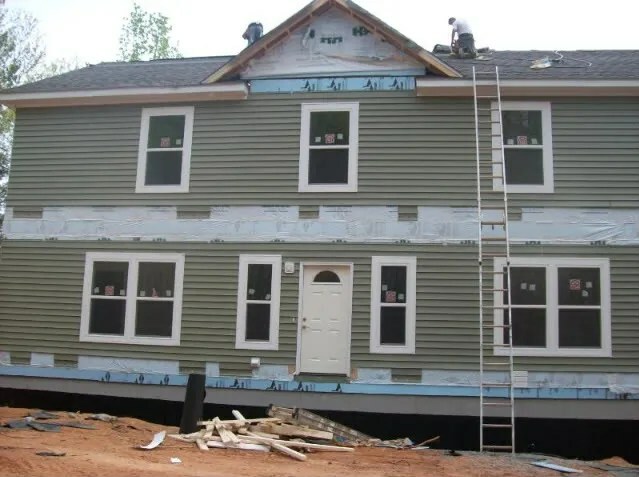 We actually wanted the whole house exterior to be Hardie Plank, but to keep costs down, we chose vinyl siding. And I love the two smaller windows flanking the front door. I don’t like the transom and sidelights that typically frame entry doors — they are too modern-looking for a girl with old farmhouse tastes. Plus it was costing us around $1,000, so I took the transome/sidelights out of the plan. However this, made my foyer, a high-traffic area dark during the day and I didn’t want to keep a lamp on in there all day. Again, Donna came to the rescue. She suggested the smaller windows flanking the door, which gave us sufficient lighting at half the cost of the more popular transome/sidelights. Isn’t Donna awesome? Weeks later . . . . . . . .
We are very, very happy our house. Hey, that WAS fun! 🙂 Noah and Claire enjoyed seeing that (and so did their Mama). Maybe next post you can show us some inside pictures. Seriously, congratulations on your house! This has been a long time comin’. WOW! That is impressive how FAST they did that! So happy for you guys! I’m crying tears of JOY for all of you!Ya’ll sure do deserve this.It looks great!Can’t wait to see it finished and you all in it.We are so,so,so happy for you! Love,Cindy P.S.Call if you need any help.O.K. Wow!!! I wasn’t there, but I wish I was!!! 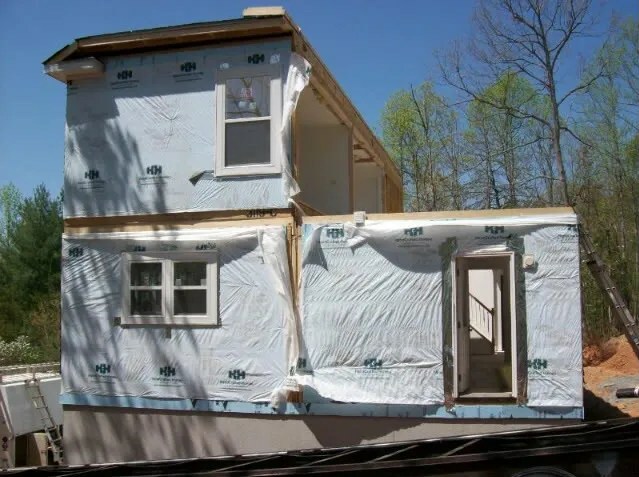 When we came over, I couldn’t tell that they put the house together from four pieces!